Burritos are one of those foods that are delicious at any time of day, from breakfast (when they tend to consist of eggs, bacon, potatoes, and salsa) to late-night second dinner (when they can consist of whatever they want to, because you are too incapacitated to know the difference). But they're known to have a negative side effect. It has to do with the main ingredient, beans, which didn't earn the moniker "the musical fruit" for nothing. Understanding that burritos cause general gastro-intestinal discomfort can be helpful in making social judgments. For instance, if you are out to dinner with someone and you're not sure whether it's a date, consider what they order to eat. If they order a dish drenched in black truffle oil or something else with rumored aphrodisiacal qualities, it's a date. If they order a burrito, it's not. I've been eating a lot of burritos from Freeb!rds and other awesome restaurants in the Isla Vista area, ever since my nutritionist recommended the combination of beans and rice. 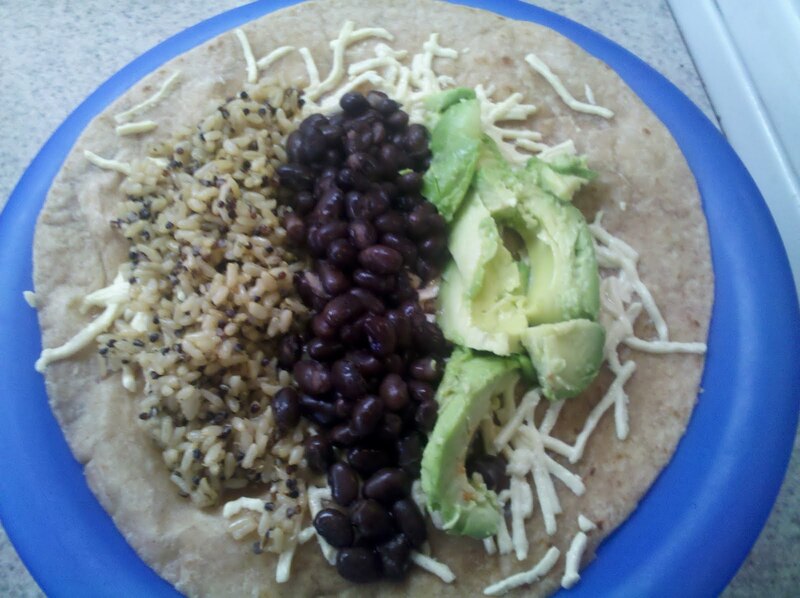 Apparently, beans + rice = a complete protein, comparable to what you'd get from eating meat. But I was sick (literally) of having to brace myself for an uncomfortable afternoon following the consumption of a burrito. And I was tired of scheduling my yoga practice around it. If you're considering practicing yoga after eating a burrito, stop considering it. So I decided to invent my own burrito that wouldn't have the same negative gassy consequences. The way to do this, I reasoned, was to cancel out the effect of the beans by including ingredients that are known to be gas-antidotes. A little poking around online led me to two satisfactory options: anise seeds and coconut oil. My sister has been bugging me to use coconut oil in my cooking because of all its health benefits (apparently, there is an entire Coconut Research Center dedicated to discovering those health benefits), so now was the perfect time to purchase some. Obviously, I headed to the Isla Vista Coop because they carry everything I've ever wanted to eat and about 100,000 other things. Daiya dairy-free mozzarella style "shreds"
I grilled the tortilla wrap in the coconut oil (anti-gas ingredient #1) for a few minutes on medium heat, then flipped it over. While it was on the heat, I sprinkled the mozzarella "shreds" on top (I think "shred" is a particularly ridiculous noun, but I guess Daiya is just too classy to call it cheeze). I wasn't sure if the fake cheese would melt like regular cheese, so I smeared it around with the bottom of a spoon to encourage it. Then it started looking gross, so I stopped. Meanwhile, I was heating up the black beans on another burner and the quinoa/brown rice combination in the microwave. Those Seeds of Change packets are incredible: all the ingredients are organic and there are no preservatives, but you just have to pop them in the microwave for 90 seconds before you eat them. Then I mixed the anise seeds (anti-gas ingredient #2) into the quinoa/brown rice combo. The seeds are really little, so they didn't affect the texture much, but they certainly added that distinct black-licorice flavor. Then I wrapped it up to eat it. It was really yummy! The anise and coconut flavors made it taste special, not like just any old vegan burrito. The fake cheese "shreds" didn't add much - they were pretty bland. But they certainly didn't taste bad, and it was fun to have the stringy-stretchy cheese experience when biting into the burrito. Since it was grilled, this was actually more of a quesadilla/burrito blend; a "quesarito," if you will. But as my friend Keith pointed out, "Libido Quesarito" just doesn't have the same pleasing ring to it as "Libido Burrito." So did the Libido Burrito live up to its awesome name? Well, "libido" isn't exactly the opposite of "gas," so the whole premise of this experiment is, admittedly, a bit of a stretch. It's not like I filled the burrito with oysters or something (blech). But the anise seeds and coconut oil definitely did the trick, and I had a comfortable, non-embarrassing yoga practice later that afternoon. So the answer is yes.